Released in December 1967, Charley’s third album was his first to reach #1 on Billboard’s Country Albums charts and even hit #199 on the all-genres chart, starting a run of fourteen consecutive top ten albums, all but one of which were top five or better. The album opens up with the Jack Clement composition “Too Hard To Say I’m Sorry”, a plodding ballad that in the hands of (almost) anyone else, would have been a complete misfire. In Charley’s hands this song of self recrimination conveys the story of a man whose pride gets in the way of apologizing and perhaps salvaging the most important relationship in his life. Next up is another Jack Clement ballad, “The Little Folks”, a song that assesses who the real losers are in a divorce. I’ve heard Willie Nelson perform the song but I’m not if he ever recorded the song. “Crystal Chandeliers” was written by Ted Harris, but the hit went to the great songwriter Carl Belew. For whatever reason, other than “Kiss An Angel Good Morning”, this has become Charley’s most requested song, even though it was never a Charley Pride single in the USA (I think it was a single for Charley in parts of Europe). Charley would repeat the song in his Live At Panther Hall album released in January 1969. “Act Naturally” was a cover of a huge Buck Owens hit from a few years earlier. Johnny Russell wrote the song and certainly saw considerable royalties from the records sold by Buck and The Beatles, let alone all the other covers. Charley’s version is good but not electrifying as was Buck’s version. “Does My Ring Hurt Your Finger”, a Robertson/Crutchfeld/Clement collaboration, reached #4, his third straight top ten single. This song of a wayward wife just drips with understated irony. Does my ring hurt your finger when you go out at night? Should I take it to the jeweler so it won’t fit so tight? Did you enjoy yourself last night, dear, how was the show? But why do you always leave your ring at home? The second single released from this album was the Jerry Foster/Bill Rice collaboration “The Day The World Stood Still”. This ballad of lost love reached #4. The next song, another Jack Clement composition, is one of my favorite Charley Pride recordings. In the middle of the song Charley calls out ‘here’s Big Joe Talbot and his electric Hawaiian steel guitar’ by way of introducing Big Joe’s instrumental break. Charley did not release this song as a single but later in the year, the Jack Clement produced Tompall & The Glaser Brothers released it as a charting single, and they too made the same introduction of Big Joe Talbot (and basically used the same arrangement). Next up is a sad ballad about a love that can’t be, written by Country Johnny Mathis. “You Can Tell The World” is pleasant enough listening, but would never be regarded as singles material. Younger listeners may remember Ricky Van Shelton’s 1988 #1 single of the Harlan Howard classic “Life Turned Her That Way”. Older listeners may remember the 1967 Mel Tillis recording that just missed the top ten or perhaps an earlier recording by Little Jimmy Dickens. Charley does a very good job with the song. No one could out-Haggard Merle Haggard on one of his compositions, and Charley couldn’t either. His version of “I Threw Away The Rose” is a pleasant jog-along ballad but nothing more than that. I liked this album, but think that the song selection was not quite as strong as on his debut album. The vocal choruses remain, but the songs are string-free and the vocal accompaniments are not too obtrusive. Nothing about this album suggest that this is anything but a country album, and while the big blockbuster singles were still on the horizon, it was clear that they were coming. A long time ago, back in 1969, there were three cousins in Fort Payne, Alabama, who decided to form a band. The band kept practicing and perfecting their craft, eventually becoming a proficient bar band, traveling the southeastern US and landing an extended gig at the Bowery in Myrtle Beach, SC. For part of this period they used the name Wildcounty but eventually the band became known simply as ‘Alabama’. They not only wrote some of their own material, but came up with a unique sound that eventually attracted the interest of the Dallas-based MDJ label. 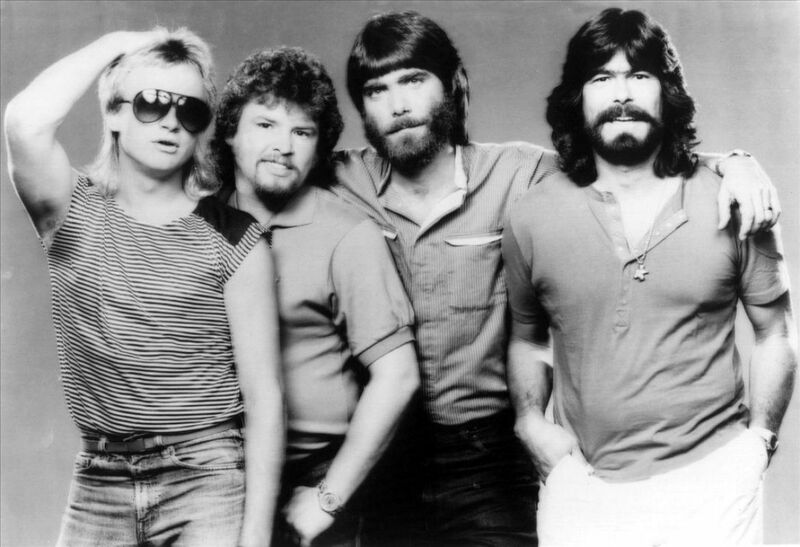 The release in 1979 on MDJ of “My Home’s In Alabama” reached #17 and got the folks at RCA Records interested in them, so much so that they signed to RCA in March 1980, beginning an extended period of huge success. At the time they arrived on the national scene in 1980, I was not a big fan of the band, but as time went by, I developed a strong respect for the band and a deeper appreciation of their music and their status as trailblazers in vocal group country music. This is not to say that there had not been vocal groups in country music before. Far from it, as groups such as the Sons of The Pioneers, The Willis Brothers, The Four Guys, The Oak Ridge Boys and, most notably, the Statler Brothers had been having considerable success for years before Alabama arrived. The Willis Brothers and Sons of the Pioneers came out of the western (or western movies) tradition and really are separate and distinct from mainstream country music. The Four Guys, The Oak Ridge Boys and The Statler Brothers came out of the gospel music traditions, and even when performing mainstream country music they frequently still sounded like gospel groups. In the case of the Oak Ridge Boys and The Statler Brothers, when commercial country success abandoned them, they turned back to recording more gospel music. Alabama was unique. They did not arise out of the western or gospel traditions but were a bar band that played in front of noisy barroom audiences, wrote their own material, covered the likes of Merle Haggard, and developed a synthesis of soft rock and country music that brought a new audience to country music. That new audience was a younger audience that had grown up on rock music but perhaps felt that rock had become too weird or perhaps simply had grown up with both rock music and country music and appreciated the synthesis that Alabama had developed. Unlike most rock music of the time, Alabama’s music was both melodious and harmonious. Unlike most country music of the 1960s and 1970s, Alabama’s music was good dance music in a way that the music of Jimmy Dickens, Roy Drusky and Jim Reeves never could be. Plus Alabama had three really good vocalists, even if RCA insisted that Randy Owen be the lead vocalist on most tracks. In addition to bringing a younger audience to country music, they were a huge influence on the genre as over the next decade, more and more vocal bands entered the scene, cautiously at first with Atlanta coming on the scene in early 1983, followed by more significant bands such as Exile, Restless Heart, Shenandoah, Diamond Rio, Sawyer Brown and many others. Alabama would have an uninterrupted run of success from 1980 thru 1999, after which time the top ten hits ceased. Along the way they would enjoy thirty-three #1 singles with six other singles reaching #2, six more reaching #3 and two more getting stranded at #4. Many of their singles reached #1 in Canada including a few late 1990s singles that did not reach #1 in the US (eh?). Alabama was lead singer Randy Owen (b. 1949) and his cousins, Teddy Gentry (b. 1952) and Jeff Cook (b. 1949). For many years it was thought by most fans that drummer Mark Herndon was a member of the group, but years after the group retired, it was revealed that he was but a paid employee of the group. Some of my older comrades may disagree, but when I listened to Alabama’s music, I always felt that I was listening to country music, if a somewhat different form of the genre. There are many album tracks which have a far more traditional sound than some of the singles. There are fiddles and steel guitars on many tracks and while the three members of Alabama were good songwriters, they did not hesitate to record good outside material. Join us as we look back at the career of Alabama. Waylon’s first album release of 1969 was Just To Satisfy You. Released in March, the album would eventually reach #7 on Billboard’s country album chart and would result in one single, “I Got You”. 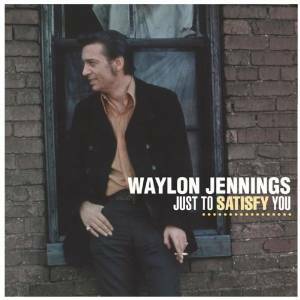 Just To Satisfy You is an eclectic mix of covers and new material that shows Waylon’s versatility, if nothing else. The album opens with “Lonely Weekends”, a song that Charlie Rich wrote during his years on Sun Records. The song never charted for Charlie on the country charts but it was an integral part of his stage show for years and did have some pop success. Waylon gives the song a strong vocal reading, but the presence of a ‘wah-wah’ guitar riff is a bit off-putting. “(Come On Home and) Sing the Blues to Daddy” was one of those songs that had ‘hit’ written all over it but it just didn’t happen for anyone. Bob Luman got the song up to #24 Billboard/#13 Record World, and many artists used the song as an album track. Waylon’s version is slower and a bit more bluesy than most versions I’ve heard, and I think the organ could be eliminated. My ears tell me that Bobby Bare is singing along with Waylon on this song, although I haven’t see him credited. Many artists recorded the Lawton Williams song “Farewell Party” before Gene Watson finally turned it into a hit single, among them Jimmy Dickens and Ray Price. Waylon’s effort would not have been a good single lacking the dramatic presentation that Watson gave it. Waylon’s version is a straight forward ballad, with piano and organ seeming to dominate the instrumental arrangement. Waylon’s version also lacks the key change at the start of the second verse that Watson’s version made the standard interpretation. “Rings of Gold”, written by Gene Thomas, was a song that reach #2 as a duet by label-mates Don Gibson and Dottie West. Waylon is joined by Anita Carter and their version could have worked as a single. Both Waylon and Anita had better voices that Don & Dottie so I don’t doubt that Waylon & Anita would have had at least as big a hit as their label-mates managed. I believe that this track was recorded a year or so before most of the tracks on the album. ‘Isn’t there anyone who’ll take me like I am‘ is the question asked in “Alone”, a Dee Moeller composition sung to perfection by Waylon. The song is a slow ballad with a mostly acoustic feel that needs to be heard several times in order to get the full impact of this very sad song. Who’ll take me like I am? Waylon and pal Don Bowman collaborated on “Just to Satisfy You”, easily the best song on the album. I love the song and I feel that RCA missed a real bet in not choosing the song for single release. I usually associate Ben Peters with upbeat songs like “Kiss An Angel Good Morning” but he was capable at the slower ballads, too. “I’ve Been Needing Someone Like You” is wistful but given a believable treatment by Waylon with harmonica prominent in the mix. Although often remembered for novelties, with “For the Kids”, Shel Silverstein shows that he can tackle serious topic as well. This song tells of the breakup of a marriage with focus on the affects of divorce on the children. Again, this is another slow ballad that Waylon nails. Ricci Mareno is probably best known for the string of successful hit records he wrote and produced for Tommy Overstreet in the early 1970s. “I Got You”, a Ricci Mareno- Gordon Galbraithvco-write was the only single released from this album. Waylon is joined by Anita Carter on this medium tempo ballad that reached #4 on the Billboard charts. At the time this record was produced, RCA was looking for reasons to use the Nashville Brass on their country recordings. There are trumpets in evidence toward the end of this single. When RCA tried to have Danny Davis, the leader of the Nashville Brass produce his records, Waylon rebelled. Waylon’s vocals are strong throughout this album and while there are a few dubious instrumentation choices, Waylon’s vocals are strong enough to salvage minor mistake. The album could use a few more up-tempo songs. I would rate this album in the B+/A- range – the substitution of a few faster songs and elimination of the organ would turn this into an A album. During the mid-1960s RCA attempted to catch the dying embers of the ‘Hootenanny’ movement of the early 1960s by positioning their artists to appeal to both country and folk audiences. Obviously this wasn’t a strategy that could be employed for every RCA country artist, but there were some artists such as George Hamilton IV, Bobby Bare and Waylon Jennings who (sort of) straddled the line between folk and country. Folk-Country was Waylon’s debut album for RCA, released in March 1966, preceded by 1965 chart singles “That’s The Chance I’ll Have To Take”, “Stop The World And Let Me Off” and “Anita You’re Dreaming”. The first two singles would show up on Waylon’s debut album. Around the time Folk-Country was released, RCA had signed Don Bowman to the label. Bowman and Jennings had been friends for a number of years and Bowman, an extraordinary comic (with a very offbeat sense of humor) and a pretty good songwriter, supplied Waylon with three songs on the debut album. The album opens up with the Harlan Howard tune “Another Bridge To Burn” which most will remember as the title song of a Ray Price album from 1966. Ray included the song in his live performances, but the only charting single of the song was by Little Jimmy Dickens who hit #28 in 1963. Piano and background singers dominate the arrangement and Waylon sings it well but the song would work better with different instrumentation. “Stop The World and Let Me Off”, a Carl Belew classic, was Waylon’s first top twenty single, reaching #16. I think Waylon’s version is the definitive version of the song. “Down Came the World” is a Bozo Darnell-Waylon Jennings collaboration. The song is a mid-tempo ballad about a love gone wrong. Not everything from the pen of Harlan Howard was a classic, as witness “I Don’t Mind”. It is not a bad song, it’s just nothing special, a typical jog-along ballad about a man wronged by a woman. Don Bowman was the sole writer of “Now Everybody Knows”. This song is about a woman who makes no effort to hide her philandering ways. If you’ll just leave me alone. What makes a man wander? The first version of “Man of Constant Sorrow” that I recall hearing was Waylon’s version of the song. WCMS disc jockey “Carolina Charlie” Wiggs liked Waylon’s version of the song and played it occasionally. To this day, I still like Waylon’s understated version of the song better than any of the more bombastic versions. Baby, are you sure you want what’s left of me? There was a tendency for RCA recording artists to have musical accompaniments that sounded very similar. This was due to the use of RCA’s studio musicians. While RCA had some truly excellent musicians in its stable, the use of these musicians (along with string and choral arrangements) resulted in recordings whose sound the artists could not replicate in live performance. Waylon (along with Willie Nelson and some others) would address this problem in the future, but at this stage of the game, none of them had sufficient leverage (or a sufficient track record) to exert that kind of influence. Because RCA was pushing this album as folk-country, the arrangements are less cluttered than the usual RCA recordings, but even with the semi-folk arrangements, the likes of the Anita Kerr Singers can be heard. Truly distinctive voices such as Waylon Jennings and Charley Pride could cut through the background clutter, but most of the smooth voiced vocalists (Eddy Arnold, Stu Phillips, Jim Ed Brown) tended to make recordings that any other similar such artist could have recorded. Even such unique vocalists as Don Gibson and Hank Locklin tended to get lost in the accompaniment. That said, Waylon’s vocals make any of his albums stand out from the usual RCA fare, and the album contains a number of interesting lyrics. 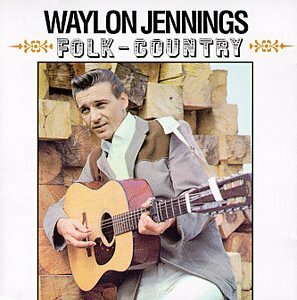 I would not regard Folk-Country as one of Waylon’s best albums, but it is a very good one that bears repeated play. I’d give it a B+ and I am grading on a downward curve. There are many successful performers who never make an album as good as Folk-Country. Mercifully, RCA gave up on the folk-country concept and started cutting Waylon with more straight-forward country arrangements. Acoustic six and twelve string guitars appear throughout this album but if there was any fiddle or steel guitar, I missed it. For most of the Classic Country era, the big four of country record labels were Decca /MCA, RCA, Columbia and Capitol. Of these labels, MCA/Decca has done the poorest job of keeping their artists’ catalogues alive in the form of reissues. When speaking of the big four labels we will need to define terms. MCA/Decca refers to recordings released on MCA, Decca, Brunswick and for some periods, Vocalion. In the early digital days MCA had virtually nothing of their classic artists available aside from some Loretta Lynn, Bill Monroe and Conway Twitty discs. Then in 1991 they started their County Music Hall of Fame Series, showcasing artists elected to the Country Music Hall of Fame. Unfortunately, because of industry politics, their biggest stars, Webb Pierce and Conway Twitty, had not yet been elected. Each of the discs contained fifteen or sixteen tracks or about 38 minutes of music. Many of the CDs featured artists who had not been on Decca for many years, and many featured artists who just passed through on their way to bigger and better things or had been bigger stars in the past. Among the CDS in the series were The Carter Family (on Decca 1937-1938), Jimmie Davis, Red Foley, Grandpa Jones (with Decca in the late 1950s – several remakes of King label hits), Loretta Lynn, Uncle Dave Macon (a real old-timer), Tex Ritter (1930s recordings), Roy Rogers, Sons of The Pioneers (with Decca during the 1930s and again in 1954), Hank Thompson (ABC/Dot recordings of the late 1960s and 1970s – MCA purchased the ABC & Dot labels – Hank never actually recorded for MCA/Decca). Floyd Tillman (1939-1944), Ernest Tubb, Kitty Wells, Bill Monroe and Bob Wills (Bob’s best years were on Columbia and MGM). The Bob Wills recordings were 1955-1967 recordings on the Decca & Kapp labels – the Kapp recordings usually featured Nashville session players with no real feel for swing and are the least essential recordings Wills ever made. Each of the CDs mentioned above are undeniably worthy, but are either inadequate or not representative of the artists’ peaks. Some MCA/Decca artists have been covered by Bear Family, most notably Ernest Tubb, Kitty Wells, Bill Monroe, Bill Anderson, Jimmy Martin and The Osborne Brothers. One could wish for more on some of these artists, but what is available generally is enough; however, it is expensive. Good two-disc sets would be desirable. During the 1960s, Decca had their artists re-record their hits in order to take advantage of modern stereo technology, since for artists who peaked before 1957, such as Kitty Wells, Ernest Tubb, Webb Pierce and Red Foley, their biggest hits were recorded in monaural sound. An additional consideration for Ernest Tubb was that his then-current band was larger and better with musicians such as Billy Byrd and Buddy Emmons (to name just two) being members of the band. In the case of Ernest Tubb, the re-recordings were superior to the original string band recordings. In the case of most other artists, I think the originals were better BUT for many years the original recordings were not available and listeners of my generation grew up hearing the stereo remakes whether on records or on the radio. Since the digital era began the stereo remakes have been unavailable except on Bear Family sets. It would be nice if the stereo remakes were available, and it would be nice if MCA/Decca artists were available on decent domestic collections. Webb Pierce – several domestic releases of Webb Pierce’s hits are available but they generally contain about a dozen songs, all from the 1950s. There is a Bear Family set that covers up to 1958 – it’s great but it misses all of Webb’s lesser later hits. Webb was the #1 country artist of the 1950s according to Billboard, and while he slipped thereafter, he was still the sixth ranked artist of the 1960s with many hits, including a couple of Record World #1s. None of this has been released on CD. What is needed is a good three CD set gathering up Webb’s 1960s (and early 1970s) chart hits plus key album tracks and the stereo remakes of the fifties hits. For as widely popular as she was. you would expect much of Barbara Mandrell‘s output to be available. Barbara moved from Epic to ABC/Dot and when ABC/Dot was absorbed by MCA, her music was issued on that label. Barbara had 30+ hits for ABC/Dot/MCA with many #1 and top five recordings. Currently, not much is available and she warrants a boxed set. Jack Greene and Cal Smith both had fairly late starts to their solo careers. While there exist a few hit collections for each artist (on foreign labels), neither is very complete, leaving off key songs. For Cal Smith, since Kapp and MCA are both owned by the same company, a two disc set collecting Cal’s Kapp & MCA/Decca singles should suffice (possibly a single disc with about thirty tracks would be okay). For Jack Greene, more is needed since Jack had over thirty chart singles for Decca and issued at least fourteen albums plus a hits collection while on MCA/Decca. Jack was a superior vocalist and his albums contain recordings of others’ hits that often were better than the original hits. While not a hit for Jack, his version of “The Last Letter” is the definitive recording of the song. The Osborne Brothers were bluegrass innovators, developing an almost unique (Jim & Jesse were doing something similar) bluegrass and country hybrid with bluegrass instruments augmented by electric guitar, steel guitar and sometimes other amplified instruments. After leaving MCA/Decca for CMH and other labels, the Osborne Brothers went back to a more traditional bluegrass approach. Almost none of that classic hybrid material is available except for a gospel CD and an excellent but short (ten songs) collection titled Country Bluegrass which seems randomly put together. No bluegrass group ever has huge numbers of hit records on the country charts, but the Osborne Brothers did chart quite a few and they should be available domestically. I would think a single disc set of thirty tracks would be acceptable, although more would be better, of course. Johnny Wright is better know as part of the duo Johnny & Jack (with Jack Anglin), but after Anglin’s death in 1963, Wright embarked on a successful solo career which saw the release of at least six albums on MCA/Decca plus twelve chart singles including the #1 “Hello Vietnam” , the first chart topper for a Tom T. Hall song. Johnny’s wife was Kitty Wells, and while he never reached her level of success as a solo artist, apparently it never bothered Wright as he and Kitty were married from 1937 until his death in 2011 at the age of 97. A good single disc collection would suffice here. The bulk of Little Jimmy Dickens’ career occurred for another label, but his time on MCA/Decca saw the release of two albums of new material plus an album featuring remakes of his earlier hits. The Decca albums featured a staple of Jimmy’s live shows “I Love Lucy Brown” and an amusing novelty “How To Catch An African Skeeter Alive”. I think most of this would fit on a single CD. Wilma Burgess was an excellent singer who came along about four decades too soon. While Wilma did not flaunt being lesbian, neither did she particularly hide it. Consequently, she never got much of a commercial push from her label. Many have recorded “Misty Blue” but none did it as well as Wilma Burgess. She recorded at least five albums for MCA/Decca plus some duets with Bud Logan, former band leader for Jim Reeves. A decent two disc set of this outstanding singer should be easy to compile. I would like to see a collection on Loretta Lynn’s siblings, Peggy Sue and Jay Lee Webb. Since Loretta’s other well known sibling started on MCA/Decca as well, it should be possible to do a good two CD set of Loretta’s kinfolks. Jay Lee Webb’s “She’s Looking Better By The Minute” is an all-time honky-tonk classic. He may have been physically diminutive but country music lost a giant and perhaps its best ambassador with the passing of Little Jimmy Dickens, who died yesterday at age 94. This song was a #6 hit for him in 1949. Ricky’s second album was released in September 1988. It was another collection of neotraditional country music including an unusually high proportion of covers, and an overwhelming theme of undying love. There were four top 5 singles, three of which hit the top spot. The first of these, ‘I’ll Leave This World Loving You’ is a beautifully sung slow ballad about a man resigned to forever love the woman who has broken his heart. It was written by Wayne Kemp, who had a minor hit with it himself in 1980, and is the kind of thing George Jones excelled at. It was also Ricky Van Shelton’s forte. Another Kemp song swearing eternal devotion ‘Don’t Send Me No Angels’ (which Jones covered a few years later) is happier in mood, although Ricky delivers it with a solemn intensity. Also hitting #1 was another cover, Ned Miller’s international hit ‘From A Jack To A King’. The bright paced love song was followed by a slightly less successful cover in the shape of the retro-rockabilly ‘Hole In My Pocket’. The Boudleaux and Felice Bryant song (previously recorded by Little Jimmy Dickens in his youth) peaked at #4. While Ricky clearly enjoyed performing in this style, and did it convincingly enough, he was much more effective as a balladeer. The up-tempo semi-rockabilly ‘Swimming Upstream’, which opens the set, is pleasant but forgettable. It was back to the ballads, and back to the top with the album’s final single, ‘Living Proof’. This emotion-laden song tells of a woman whose life is dominated by a love enduring through heartbreak, and her eventual reunion with the protagonist. Ricky delved back into country music history for another cover, the Wilburn Brothers’ plaintive ‘Somebody’s Back in Town’, which I like a great deal. He also delivers the country standard ‘He’s Got You’ beautifully, with real passion and commitment, paced a little quicker than the Patsy Cline or Jim Reeves classic versions. This second album was an excellent one, and I like it better than its predecessor. It’s well worth catching up with now. Like the latter, it sold very well and was certified platinum, positioning Ricky as one of the biggest stars of the era. 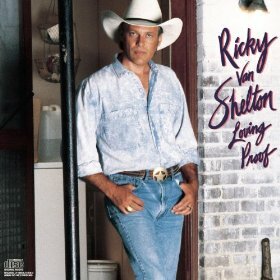 Ricky Van Shelton released his debut album, Wild-Eyed Dream in May 1987. Produced by Steve Buckingham on Columbia Nashville the record went platinum and spawned three number one hits. The title track, written by Alan Rhody, served as the first single. The mid-tempo traditional yet contemporary number, which is generic as far as Shelton singles go, peaked at #24. Second single “Crimes of Passion,” an uptempo number, was much better and marked his first appearance in the top 10. Starting with his third single, Shelton would score five consecutive number one hits between Wild-Eyed Dream and his sophomore effort Loving Proof. The first of those was the stone cold “Somebody Lied,” which Conway Twitty also recorded the same year. It’s an excellent number that perfectly showcases Shelton’s unique vocal phrasing backed by a glorious helping of steel and piano. 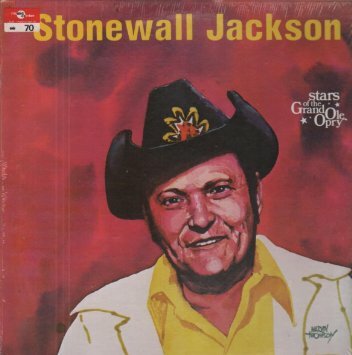 The next single, my favorite track on the album, is sonically similar yet even stronger than “Somebody Lied.” “Life Turned Her That Way” is a brilliant Harlan Howard number previously recorded by a slew of artists including Little Jimmy Dickens, Mel Tillis, George Jones, Willie Nelson, and Ernest Tubb. Shelton’s version is the most recognizable, the perfect marriage of singer, arrangement, and lyric. Roger Miller’s similarly structured ballad “Don’t We All Have The Right” served as the final single. The track is given a slightly more contemporary arrangement with less steel guitar, but works just the same. For a debut album, it’s surprising how many cover songs Shelton was able to record. More than half of Wild-Eyed Dream is peppered with tracks nodding to country music’s heritage, which seems appropriate given Shelton’s vintage vocal stylings and throwback image. Shelton resurrects the Buck Owens’ classic “I Don’t Care,” giving it a similar arrangement to the original. He makes the track his own, though, by singing it in his own style opposed to imitating Owens. It’s a smart move that pays off in spades. Shelton closes out the album with his version of Merle Haggard’s “Working Man Blues,” once again nodding to Haggard through the production while vocally making the song his own. Like “I Don’t Care,” it’s excellent and worthy of inclusion on the project. “Crazy Over You” wasn’t a cover when Shelton recorded it, just another version of the song that would introduce Foster & Lloyd the following year. Both versions are nearly identical; marking one place Shelton doesn’t bring uniqueness to a track. The remaining tracks on Wild-Eyed Dream consisted of original material. “Baby, I’m Ready” is a bluesy honky-tonk number while “Ultimately Fine” is an ear-catching slice of rockabilly. As a whole, Wild-Eyed Dream is an excellent introduction to Shelton as an artist who kept one foot in the genre’s past while staying on top of the neo-traditional trends that were dominating at the time. He also didn’t sound like anyone else on the radio, which helped him standout even more. As far as debut albums go, this is one of the better ones, and comes highly recommended. In 2009, I had the opportunity to interview Gene for the now quiescent http://www.9513.com after the release of his A Taste of The Truth album. PWD: I read recently in an interview that was done on another website concerning your interest in automobiles. I won’t rehash that territory, but being a fan of autos, do you have any particular favorites among the racing circuits – either CART, Indy, or NASCAR? GW: Well, I watch drags. I like NHRA and I like NASCAR, too. I’m a John Force fan – the whole team in the drag racing field. I’m a huge fan of Carl Edwards. I like all types of racing. But NASCAR and drag – NHRA – would probably be my favorites [PWD note: as of 2011, Gene still owned and operated a body shop]. PWD: I’ve noted that some of the European labels have done a good job of getting some of your older recordings back in print. I have no idea who Hux Records is, but they became my favorite label when they started reissuing some of those old Capitol albums of yours. How did that come to be? GW: I don’t know. You know, that was negotiated through Capitol Records. Unfortunately, I don’t own the masters. If I did, they would be available through me… Hux has been real good to put these selections together. They’re usually on a dual album set. The people that are fortunate enough to find them, they tell us how proud they are to have them back because a lot of those songs are out of print. You can’t buy them any more, so it just kind of gave them a new life when Hux came back with them. PWD: Are there any plans for any of your MCA, Epic, or Warner Brothers cuts to be reissued? PWD: I’ve seen recently that some of your recordings are available on the website for Tee Vee Records, King Records, Gusto – those labels. Are those new recordings or are those reissues of some of the older stuff? PWD: I thought it’d be interesting to maybe get you to discuss some of the recordings of the past. Would you mind? PWD: Let’s see how it goes. I’m going to ask you first off about my absolute favorite Gene Watson recording – and there are about ninety-five others that are in second place – but the one that just really grabbed me when I first heard it was “The Old Man and His Horn.” It sounds like there should be a story behind that one. GW: Well, there is. The same guy [Dallas Harms] that wrote “Paper Rosie” and “Cowboy’s Don’t Get Lucky All the Time” for me wrote that song and it’s been an extremely difficult song to follow through with. The recording was a little bit different because of the horns. We had trouble tracking them in studio – we laid down all the tracks at Bradley’s Barn here in Nashville – and when we recorded, we had trouble getting the horn on the track, so what we did was to lay down all the rest of the tracks, even including my vocal. Then, after we sought out the horn player that we wanted to use, we found that we couldn’t use trumpet, it was too brash. By the time we found what we wanted to do, we came back up to Sound Emporium – Jack Clement’s recording studio – and we went in and we put it on. Actually, what that is is a flugelhorn – it’s a little bit more mellow and everything. PWD: I was wondering about that, it didn’t quite sound like a trumpet to my ear, but I don’t have a classically trained ear. GW: Yeah, we tried trumpet, but it was too shrill, too brash, and cutting too hard. So we thought on it and looked around and done some research and everything and we wound up using a flugelhorn on it. Of course, you know, I can’t hire a horn player just to travel the road with me just to play one song, so it automatically became a thorn in my side as far as reproduction on stage. So what we did was, at that time I had my steel guitar player get an attachment to put on his steel guitar and we would do that horn part on the steel. It did work pretty good for a while. We had a lot of requests for that song and I appreciate you liking it. PWD: It’s my favorite, although I must admit I’ve liked everything you have recorded. I remember first hearing, I guess it was around January or February of 1975, a song called “Bad Water” that I don’t think did a whole lot, but the follow-up, which I think was also originally on Resco, was “Love In The Hot Afternoon.” That was a great record and very different from what anyone else was recording at the time. GW: “Bad Water,” that was a song that was originally out by Ray Charles’ background singers The Raelets. I decided to do it up country and believe it or not, that was the first song I ever had that got in the national charts. That got Capitol Records’ attention and when we re-released “Love In The Hot Afternoon” on Capitol they signed me to a long-term contract and that song turned out to be a giant for the year 1975. PWD: I remember it well. It seemed to be on the air all the time in the area in which I live, which is Orlando, Florida. And it seemed like it was getting quite a bit of airplay on stations that weren’t country radio stations. GW: Yeah, it was a good song for me. PWD: … Do you have any particular favorites among the songs you’ve recorded? GW: I’ve always had the freedom to pick and choose all of my material myself and it seems like to pick one as a favorite would be like picking one of your kids. .. There’s something about all of them that got my attention that I like. I’m not saying that all of them came out as favorites, but there was, anytime I recorded a song, there was something about it that I appreciated. “Farewell Party” is by far the most requested song that I’ve recorded, but I still like to do “Got No Reason Now For Going Home” and “Paper Rosie” and “Fourteen Carat Mind” and all that. PWD: I think “Farewell Party” was your first #1, going to the top on Cash Box. If I recall correctly, that was a Lawton Williams song. PWD: And it seems like years before your record I remembered hearing Little Jimmy Dickens do it. GW: There were several people that had recorded it. Waylon Jennings, for one. Billy Walker and George Jones recorded it as had a lot of other artists. PWD: I guess it took your touch to make a hit out of it though. GW: I guess so. Because it’s sure been a good one for me. PWD: It has. That and “Fourteen Carat Mind” are songs you still hear country bands performing all the time. GW: That was a #1 hit in 1982, “Fourteen Carat Mind” was. I’ve been extremely fortunate and I owe all the thanks to the fans out there, and of course you guys who play the music. I try my best to record the best material I can and then it’s up to the folks whether it hits or not. PWD: Do you have any songs that you recall that were offered to you first that you passed on that later became big hits? GW: Oh yeah. Oh Lord, I heard “The Gambler” before Kenny Rogers did it. “The Girls All Get Prettier At Closing Time.” There’s been a lot of them, but that doesn’t mean that these songs would have been hits for Gene Watson. I mean they were hits for the people that recorded them, but there are Gene Watson hits and then there are other people’s hits and a lot of times it’d be like another artist recording “Farewell Party.” There were a lot of them before me that didn’t make it. When I recorded it, fortunately for me, it did. That’s kind of the trend that you have to look at when you’re considering material to record. You need to be careful and pick songs that you think are right for you. PWD: One of the later hits that you had that I really liked, and haven’t been able to find it on CD, was “Don’t Waste It On the Blues.” That was a little different for Gene Watson. GW: Yeah, it was a little uptown swing thing, almost modern jazz. I love that kind of stuff. I’m a lover of that type of music and it was a great song for me. Best I remember, I think it was a Top Five song. PWD: …Did you ever have a song that you recorded that you just thought, “This has hit written all over it,” and then it stiffed for some reason or another? GW: There have been several like that. In fact, I try to have that attitude every time I go in the studio, thinking that I’ve got a hit. You know that a lot of them are more capable of being hits than others, but that happens quite occasionally. PWD: One that struck me that should have been a big hit that wasn’t, was a song you did titled “Carmen,” which I think was on your first or second Epic album. GW: Yeah, that was a big song. In fact, that’s still a real big song overseas. When we were in Ireland and England and Scotland, the people over there just love that song and we always get requests for it when we go over there, but the title I think hurt the song a little bit in being confused with the old song of Marty Robbins’ called “Carmen.” Not that his was bad, but it was a hit and every time everybody saw the title they automatically thought that I had covered Marty’s song and that hurt it a whole lot. PWD: Another Epic song I thought should have been a hit was “Honky Tonk Crazy”, a song local bands here in Florida often cover. GW: Great song. That was my last album for Epic Records, and yeah, I thought it should have been a hit too. I really did. You can look down in that album and I was extremely proud of that whole album. I think everything in that album was really fantastic. Of course, it was produced by Billy Sherrill. I just thought it was a good album. I thought we should have got more response. I’m not sure we got all the help from Epic Records that we deserved, but for some reason or another, who knows why, it didn’t quite make it as good as we thought it would. PWD: Were your parents musical people? GW: My whole family was musical. PWD: So you grew up listening to country music? Perhaps other forms of music ? GW: Gospel, country, country gospel, and blues. I used to sing the blues and everything, so yeah, my whole family was musically inclined. PWD: Who were your favorite artists when you were growing up? GW: Oh I don’t know, I listened to all of them. Boy, back then they had the Top 10 on Sunday and I loved Lefty Frizzell. 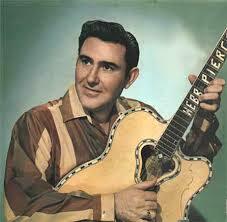 I thought he was fantastic, and Webb Pierce, Carl Smith, Faron Young. When Hag come in to play, oh it kind of ruled everything else out. PWD: I’m not sure I’d agree with you there, but I liked all those names that you mentioned. GW: Well I don’t mean ruled it out, I’m just talking about the new…I think Merle Haggard was more of an extension of Lefty Frizzell. I always loved Lefty, I loved his smooth approach. I liked the way he recorded things, and Ray Price, what can you say about him? I had a lot of favorites and it would be hard to pick one of them. PWD: How about among the younger artists? GW: I think one of the best artists out there is a guy by the name of Joe Diffie. I think he’s one of the finest vocalists that you’re going to find out there. My good friend Joe Nichols is a fantastic artist. There are several of them out there that I really, really admire and I appreciate what they do. There’s more of them out there that I don’t appreciate, but there’s some of them that’s got great talent and they’re for real. PWD: I remember about a year or two ago you opened a show for Brad Paisley, didn’t you? PWD: That must have been a little different experience with the type of audiences and venues he plays. GW: My thing is my thing and I do it no matter who I’m working with, or opening for, or closing for or whatever. We never plan a show. I always hit the stage and the band, the only way they know what I’m going to do next is the way I introduce it to the people, and it was fun, it really was. I think the world of Brad. He’s a great artist and it was a real pleasure getting to work with him, but you know we do what we do and he does what he does and we all try to be successful at it. PWD: … Any plans for perhaps a duet album with one of the leading female singers, say Rhonda or Alison or someone like that? I think that would really come off well. “Because You Believed In Me” was a song that originally appeared on Gene’s 1969 debut album on the World Wide label. The original recording was good, but Gene had developed as a vocalist in the ensuing five years. Written by the legendary A.L. ‘Doodle’ Owens, this song was a straightforward ballad which reached #20 as a single. I would have picked “If I’m A Fool For Leaving (I’d Be Twice The Fool To Stay)” for release as a single. Written by Skip Graves and Little Jimmy Dickens, the song showcases the fiddle of Buddy Spicher and the steel guitar of Lloyd Green to good effect, coupled with a superb vocal. This track is my favorite track on the album but, of course, I like my country music a little more country than most. Larry Gatlin penned and had a minor hit in 1974 with “Bitter They Are, Harder They Fall”, a great song that was also recorded by the likes of Elvis Presley, Anne Murray and Dottie West and various others. This is the best rendition of the song, bar none, although I would have preferred that they not used a fade-out ending for the song. “My World Left Town” is a fairly typical my-girl-left-me song written by Tom Ghent and R. Paul, that in the hands of a typical artist would be nothing special. With a nice fiddle and steel arrangement and Gene’s vocals, the song is elevated beyond that. It’s not an immortal classic, but the song reaches its full potential with this recording. Roger Miller penned “Sorry Willie” and while it is sometimes thought to be about Willie Nelson (and Roger & Willie recorded the song on their Old Friends album), I don’t think Roger would ever have visualized Willie Nelson as the loser portrayed in this song. The song is a slow ballad with the piano of Hargis ‘Pig’ Robbins being a highlight of the arrangement. Canadian Ray Griff was a prominent singer-songwriter of the late 1960s – mid 1970s. Although he had some mostly mid-chart success as a vocalist on the American Country charts (he was a far bigger star in his native Canada with 41 chart records), his U.S. success came in the form of the hits that he wrote for others such as Faron Young, George Hamilton IV and Jerry Lee Lewis. Gene rounded up four of Ray’s songs for this album. “How Good A Bad Woman Feels” would have made a good single. Griff’s “Her Body Couldn’t Keep You (Off My Mind)” was the second single released from this album. It stalled at #52, but perhaps Capitol learned something from the relative failure of this song because the next twelve singles all made the top twenty (mostly) the top ten. I not sure what it was they learned because I though this was a pretty good song. Hank Cochran was the writer on “When You Turned Loose (I Fell Apart) “, a slow ballad that to me is just another good Hank Cochran song made better by Gene’s vocals. A pair of Ray Griff compositions, “Hey Louella” and “Then You Came Along” close out the album. “Hey Louella” is an up-tempo number with a Cajun feel to it. It’s fun but it’s a song that any half decent singer could have sung and doesn’t really give Gene a chance to demonstrate his vocal prowess. “Then You Came Along” is a nice jog-along ballad of the kind that Gene always performs well. Gene would go on to bigger and better things, but this album maintained the momentum from his major label debut album. Although I’ve pointed out their contribution in conjunction with specific songs, the contributions of Buddy Spicher, Lloyd Green and Pig Robbins to the overall sound of the recording cannot be overstated. There are vestiges of the ‘Nashville Sound’ production (strings and choruses) but those are kept to a minimum and are unobtrusive. Capitol released this album in May 1976. Currently it is available on CD paired with Beautiful Country, an album that will be reviewed next. The steel guitar has been an iconic instrument in country music since it was first used in the genre. That doesn’t mean its use has been unchanged; more than almost any other instrument its specification and capabilities have changed with time. a large part of that is down to the legendary Buddy Emmons, one of the most brilliant and innovative musicians ever to be involved in country music, and creators of various new styles of steel guitar. Emmons is saluted in this fine tribute record. Steel player Steve Fishell, currently touring with Emmylou Harris and Rodney Crowell, produced, and his steel player’s natural understanding for and love of the instrument and the man being paid tribute to help to make this a worthy tribute to one of the giants of country (and not just country) musicianship – Emmons has also been active in jazz. The selected songs are ones where Emmons performed on the classic recording; some of them he wrote. The steel playing, courtesy of a dozen or so of today’s most accomplished steel players, is gorgeous throughout (although it doesn’t feature on every track), and the record recommends itself to a wider audience by the use of some starry guest vocalists on most tracks. A couple of great non-steel guitarists contribute too (Duane Eddy and Albert Lee). A brace of instrumentals place the instrument center stage, but good though they are, it is the vocal tracks which non-specialists will gravitate to. Fishell plays on my favorite track, a lovely duet by Emmylou Harris and Rodney Crowell on Gram Parsons’ ‘That’s All It Took’. Emmylou swoops and soars as a counterpoint to Rodney’s more measured vocal as they swap lines. Also very fine is Willie Nelson on the questioning ‘Are You Sure’, which he wrote with Emmons in the 60s. Nelson belies his age with his usual precise, distinctive phrasing and understated but believable emotional commitment. John Anderson is at his best on ‘Half A Mind’, originally recorded by Ernest Tubb with Emmons. It’s always a pleasure to hear Anderson singing hard country, and this is great, with Buck Reid’s steel backing him up nicely in very traditional style. Gill and Franklin turn from the Bakersfield sound of their wonderful recent project together to some very retro western swing on ‘Country Boy’ (a 1949 hit for Little Jimmy Dickens, before Emmons joined him, but one he must have played many times). Raul Malo is ideally suited to a loungy jazzy take on ‘Night Life’, but Chris Stapleton’s take on ‘Feel So Bad’ is a bit too far in the blues direction for my personal taste. Both tracks do, however, help to show the breadth of Emmons’s contributions to music in general. Veteran Little Jimmy Dickens sounds fairly wrecked vocally on ‘When Your House Is Not A Home’, but then he is over 90 and not in the best of health. His inclusion is a nice touch as he was Emmons’ first major employer in the 1950s, bringing the remarkably talented teenager to Nashville. A couple of guitarists try singing, with mixed results. I quite enjoyed the folky vocal at the end of ‘Wild Mountain Thyme’ by steel player Greg Leisz, following a long, lyrical steel solo, but British-born Albert Lee (once a member of Emmylou Harris’s Hot Band and writer of Ricky Skaggs’s hit ‘Country Boy’) isn’t much good as a vocalist, and ‘Rainbows All Over Your Blues’ is one track which would have been much better off as a pure instrumental. This is an excellent tribute to someone worthy of all the acclaim he is given, and it is all the better that (unlike the equally good Hank Cochran tribute from last year) it is released in Emmons’s lifetime. It is also genuinely great music in its own right. I recommend it to all country music fans, especially if you like the steel guitar showcased.